Comparing the somites of an embryo with teeth impressions on a piece of gum. This article focuses on the term mudghah مُضْغَةً – the third stage of human prenatal development according to the Qur’an. This article is based on a lecture delivered by Dr. Keith L. Moore at the University of Illinois, Chicago, USA (1990) titled Embryology in the Qur’an and the book Human Development as Described in the Qur’an and Sunnah (1994). Figure 1. Photograph of embryo at the end of the ‘alaqah stage (age 24 to 25 days). Ten pairs of the 13 pairs of somites are easily recognized, but the embryo is still relatively straight and has a leech-like appearance. (Source: The Kyoto Collection). The embryo at 24-25 days is finishing the ‘alaqah stage (Figure 1). It changes into the mudghah stage at 26-27 days. The transformation from ‘alaqah to mudghah is in fact very rapid, and during the last day or two of the ‘alaqah stage, the embryo is beginning to develop some of the characteristics of the mudghah, e.g. the somites begin to appear and become a distinct feature of this stage (Figure 2). Figure 2. Drawings of embryos during the fourth week. A, B, C, Lateral views of the embryos, showing 16, 27, and 33 somites respectively. A, The embryo in the last day of the ‘alaqah stage. B and C, Embryos in the beginning of the mudghah stage. (Source: The Developing Human, 4th Ed, 1988). When choosing terms for the stages in embryonic development, the term should be related to the appearance and the main internal features of the embryo. Therefore, the term mudghah should apply with the shape of a substance that the teeth have chewed, according to the first meaning we have given. The appropriateness of the use of the term mudghah has been indicated in modern embryology. It has been determined that after the formation of the embryo and the placenta, the embryo receives it nutrients and energy. Thus the growth process increases rapidly. The bodily masses, called somites, from which the bones and muscle of the back will be formed, start to appear. Due to the multitude of the bead-like structures or somites present, the embryo has the appearance of a substance that has been imprinted by teeth. The application of the term mudghah in describing the processes of this period are described in the following sections. The appearance of the somites or “imprints” changes continuously, just as the teeth imprint changes on a chewed substance with each act of chewing. The embryo changes its overall shape, but the structures derived from the somites remain. Just as a substance acquires furrows, swellings and a corrugated surface as it is being chewed, so does the appearance of the embryo (Figure 3 and Figure 4). The embryo turns in its position due to the modifications in its center of gravity with new tissue formation, similar to the turning of a substance with chewing. Just as a chewed substance becomes curled before being swallowed, so does the back of the embryo become curved. Figure 4. Comparing the appearance of an embryo at the mudghah stage with a piece of gum that has been chewed. A, an embryo at around 26 days showing several pairs of bead-like somites. (The Developing Human, Moore and Persaud, 5th ed., p. 79.) 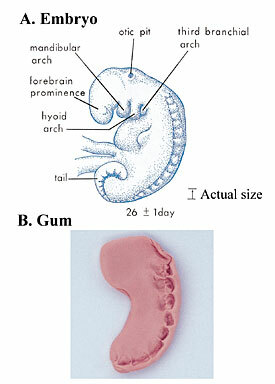 B, a piece of gum that has been shaped like an embryo and then chewed. Note how the teeth marks on the chewed substance resemble somites of the embryo. The somites represent the beginnings or primordia of the vertebrae. As for the second meaning of “small substances” for mudghah, the embryo is approximately 1.0cm in length at this stage, and therefore very small. Thus the meaning “the small substances” applies in the sense of the embryo’s size. This is so because all human organs form during the mudghah stage as small buds. The third meaning of mudghah as “a piece of meat of a size that can be chewed”, given by some Qur’anic commentators, applies again in regard to the size of the embryo. At this stage, the embryo is approximately 1.0cm in length, and this is approximately the size of a substance that would be chewed. The preceding stage of ‘alaqah, for example, is not a size to be chewed, since it is not more than 3.5mm in length. The term mudghah مُضْغَةً is the third stage of human prenatal development according to the Qur’an. The description of the embryo as mudghah is remarkable if one considers that the embryo is extremely small, measuring no more than 1.0cm in length. As there were no microscopes or lenses available in the 7th century, doctors would not have known that the human embryo had this chewed-like appearance. The Holy Qur’an 39:6 and 71:14. The creation of the first man Adam. Az-Zabīdī, Tāj al-‘Arūs, 1st edition, n.p., Cairo, 1306 A.H., vol. 6, p 30; Ibn Fāris, Mu‛jam Maqāyīs al-Lughah, Dār al-Kutub al-‘Ilmiyyah, Iran, n.d., vol. 5, p 330; and Abū Hayyān, Al-Baḥr, Vol. 6, p 352. As cited in Zindani, A. A., Ahmed, M. A., Tobin, M. B., & Persaud, T. V. N. (1994). Human Development as Described in the Qur’an and Sunnah: Islamic Academy for Scientific Research, p. 79. Al-Biqā‛i, Naẓm ad-Durar fī Tanāsub al-Ᾱyāt was-Suwar, vol. 6, pp 30-31; and Ibn Manẓūr, Lisān al-‘Arab, Dār Ṣādir, Beirut, n.d., vol. 8, pp 450-452. As cited in Zindani et al. (1994, p. 79). Ash-Shawkānī, Fatḥ al-Qadīr al-Jāmi‛ Bayna Fannay ar-Riwāyah wad-Dirāyah min ‛Ilm at-Tafsīr, 3rd edition, Dār al-Fikr, Beiruit, 1393 AH, 1973 CE, vol. 3, p 436; Tafsīr al-Bayḍāwi, vol. 4, pp 288-289; Ibn Kathīr, Tafsīr al-Qur’ān al-’Azīm, vol. 3, p 307; Al-Biqā‛i, Naẓm ad-Durar fī Tanāsub al-Ᾱyāt was-Suwar, Vol. 1, p 9; Al-Alusī, Rūḥ al-Ma‛ānī fī Tafsīr al-Qur’ān al-‘Azīm was-Sab‛ al-Mathāni, vol. 17, p 116; Ibn Al-Jawzī, Zād Al-Masīr fi ‘Ilm at-Tafsīr, vol. 5, p 47; Al-Qurṭubī, Al-Jāmi‛ li-Aḥkām al-Qur’ān, Dār Iḥyā at-Turāth al-‘Arabī, Beirut, n.d., vol. 12, p 906; Al-Qāsimī, Maḥāsin at-Ta’wīl, vol. 12, p 8; Az-Zamakhsharī, Al-Kashshāf ’an Ḥaqā’iq at-Tanzīl wa Uyūn al-Aqāwīl fī Wujūh at-Ta’wīl, vol. 3, p 5; Aṭ-Ṭabarī, Jāmi’ al-Bayān fī Tafsīr al-Qur’ān, Dār al-Ma’rifah, Beirut, 1398 A.H., 1978 A.D., vol. 18, p 8; and Ar-Rāzī, Tafsīr al-Fakhr Ar-Rāzī, vol. 12, p 8. As cited in Zindani et al. (1994, p. 79). The Greek μασήματος (ma-see-ma-tos) meaning something that has been chewed is indeed the translation of the Arabic mudghah. (see The Byzantine Understanding of the Qur’anic Term al-Samad and the Greek Translation of the Qur’an. Speculum 86, 2011, page 901).